With the new God of War game coming out in March under the name of God of War: Ascension, I decided to round up my reviews of the God of War series with the obvious choice of the God of War Origins Collection. I love this series. Some of these games are some of my favorite action games of all time, alongside games like Bayonetta, Castlevania Lords of Shadow, and you get the idea. While some of the games in the series don’t age well, like the first God of War, it’s still a really consistent series. Sure, someone might a personal favorite amongst the game series, but they are all good games. God of War 2, Ghost of Sparta and God of War 3 are my favorites out of the bunch, but I still enjoyed playing through Chains of Olympus and the first game. It isn’t like Devil May Cry where the first game is now intolerable control wise and difficulty wise, the second game is just bad, the third game being the best, and the 4th game being a half-baked action game. Let us get started with the two games that come in the Origin’s Collection, Chains of Olympus and Ghost of Sparta. I decided to review both games so I will talk about both games at once. I will start off with the stuff about Chains of Olympus first, and then cover Ghost of Sparta. Think of this like my review of Stacking where I reviewed both the game and its DLC in the same review. Let’s get started. 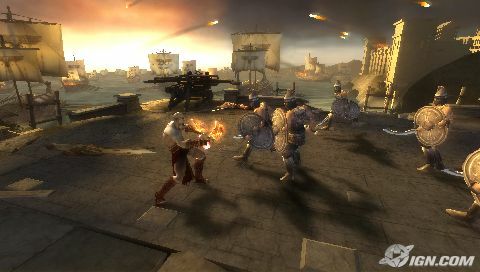 Chains of Olympus takes place at the very beginning of the God of War storyline as Kratos is sent to stop a Persian army and its pet basilisk that wants to have Greece be ruled under the Persian Empire. Fun fact, the Persian king that you fight is voiced by comedian and voice actor, Fred Tatasciore. After beating both the Persian army and the giant basilisk, the sun god Helios is captured by the Titan, Atlas, who was released by Hades’ wife, Persephone, who is voiced by Marina Gordon. She wants to take revenge on the Gods for “tricking her” into marrying Hades and being the queen of the Underworld by putting the Gods in a deep slumber. It is up to Kratos to save the day. Ghost of Sparta takes place after the first God of War game where Kratos is now the new God of War, but is still haunted by the thoughts and dreams of his past. He then decides to seek the source of these nightmarish thoughts, and in the mist of it all, finds out his brother Deimos, voiced by Mark Deklin is still alive after so many years. Kratos then seeks out the God of Death Thanatos, voiced by Arthur Burghardt, who is holding his soul in the Domain of Death. The stories for both games are actually pretty good and they do cover a lot of Kratos’ past. It can also be rather dark in both games. In Chains of Olympus, you find your daughter (who you accidentally killed) and end up returning to normal to be with her, but end up dooming the world around the land where your daughter is being held. In Ghost of Sparta, you are forced to kill your mother and fight your brother. While Ghost of Sparta might have the superior story with more epic events, both stories are still worth checking out, though I will admit Chains of Olympus does leave a couple of unanswered questions in events that happen in the future games. The gameplay in both games is more of what you love about the series. You use swords attached to chains that are wrapped around your arms, and you beat the living tar out of Greek mythology. The first game is more akin to the first God of War where there are basically two melee weapons, a couple of magic spells, and only has like 4 bosses throughout the entire game. It is also more platforming and puzzle-oriented than the other games in the series, but the puzzles aren’t that hard and tedious compared to God of War 1 and the later part of God of War 2. The only real cool weapon you get is this giant gauntlet that will help you beat your way through armored enemies. You also get a cool shield and a cool projectile weapon that requires the use of the shield. Ghost of Sparta is very much like how God of War 2 and 3 are designed. You get more weapons, more bosses, more epic and dynamic moments, and a much more entertaining story. You get cool weapons, like a spear and shield, a giant lightning shooting eye, a black hole, and a horn you swing around to make enemies freeze around you. 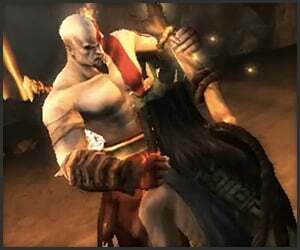 Kratos also gets a power-up he can use to break off armor pieces of enemies or tougher enemies in general. It acts as the “rage meter” kind of power-up that increases the attack damage your blades do. Ghost of Sparta is also, in my opinion, the tougher of the two, not because of puzzles, but because of the fights you are put in. Overall however, both games are pretty enjoyable. Graphically, both ports look great even if some areas are a bit too dark. Some of the character models look a bit weird from moving from the PSP to the PS3, but overall, the presentation graphically, is good. The rest is what you would usually expect from the God of War series. You have high quality music and voice acting that is rounded out by top quality talent in all aspects of the game. I will admit however, the music is mostly the same that you hear throughout the other games. That is just my opinion though. So, what is wrong with these two games? Well, let us start with Chains of Olympus. Like I said before, it suffers the same problems from God of War 1. The puzzles take up most of the playtime and there just aren’t that many bosses or weapons. It bugs me when companies do this with their action games since I love fighting bosses because they break up the gameplay. There are basically 4 bosses in the game and that just isn’t enough. I also felt like while the villain’s plan was dynamic and interesting, the main antagonist wasn’t as compelling. She was fine, but I think later games had more compelling villains. Before I move onto the next game, there is one funny plot hole that pops up that I’m going to explain. The main antagonist in the game is Hades’ wife. In Chains of Olympus, you end up killing her, and later in God of War 1, Hades doesn’t seem to mind that you killed his wife. It’s kind of funny since then, he gets pissed at you in God of War 3. I guess Hades had a brain fart or something and forgot that Kratos killed his wife, who tried to kill him. Oh well. Another plot hole that I haven’t seen fixed yet is the story of the Dream God, who you never get to see or deal with in the future games. What happened to him?! He could have easily been another antagonist in the third God of War game, but is never mentioned there. Let us hope he appears in the future title. Now, coming to Ghost of Sparta, it doesn’t have as many flaws. One of the few gripes I have is that you have to unlock everything in that game by spending blood points and you are not fully told in the “unlock stuff here area” what is what, and it bugs me at how pricy everything is. Another thing I don’t like is how a lot of the enemies are brought over from the first game. There are new enemies here, but it seems like a huge chunk of them were brought over from the past game. Overall, this is a great collection to own for the PS3. If you missed out on the PSP, you don’t have to worry since you can get these two good action games for the PS3 now with HD graphics and improved controls. You can also get these two games along with the three console games in the God of War Saga collection for the PS3, and it’s about 40 bucks. I am excited to play God of War Ascension and I will make sure to let you all know how I feel about it. These two games get an 8 out of 10.